Prime Minister Modi and Crown Prince Sheikh Mohammad bin Zayed al Nahyan held bilateral talks after a ceremonial welcome at the Presidential Palace in Abu Dhabi. 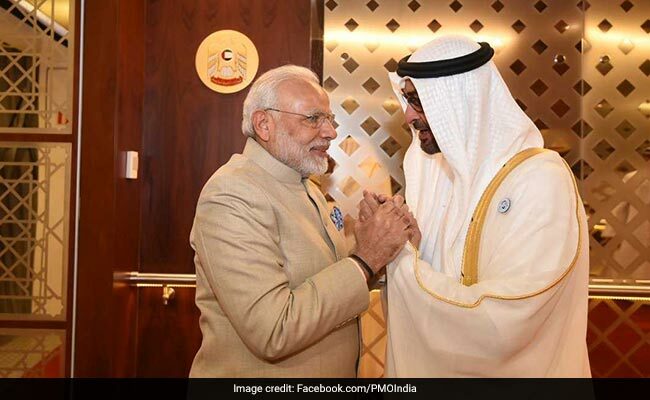 It was straight down to business after Prime Minister Narendra Modi landed at Abu Dhabi airport on his second visit to the United Arab Emirates. Prime Minister held delegation-level talks with Crown Prince of Abu Dhabi. The two sides inked 5 agreements related to energy & railway sectors, manpower and financial services. MoU aiming at technical cooperation in rail sector between Ministry of railways and Federal transport authority and maritime of UAE signed. This will facilitate development of Joint Projects, Knowledge Sharing, Joint Research and Technology Transfer. In the area of financial services, MoU between BSE and Abu Dhabi Securities exchange was also inked. MoU between Government of Jammu and Kashmir and DP World was also signed to establish multi-modal logistics park and hub in Jammu comprising warehouses and specialized storage solutions. Prime Minister Narendra Modi will be laying the foundation stone of the first Hindu temple in Abu Dhabi on Sunday. Members of the temple committee met PM Modi and the Abu Dhabi Crown Prince and presented them with mementoes to express their gratitude. Crown Prince of Abu Dhabi also hosted a grand Banquet dinner in honour of Prime Minister Modi and the Indian delegation. Day one of Prime Minister Narendra Modi's UAE visit saw substantial outcomes with ties between the two countries surging ahead.